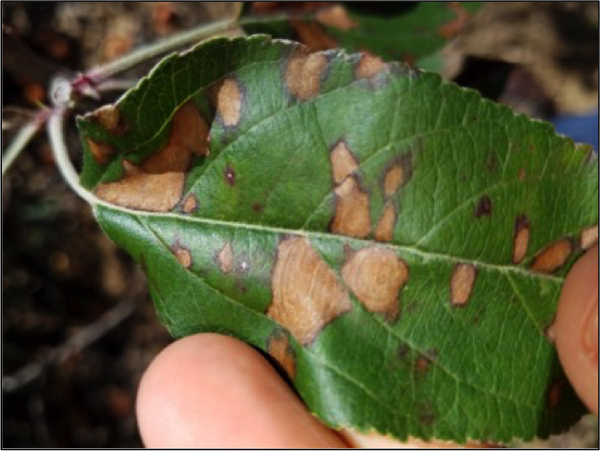 Glomerella leaf spot and fruit rot is a devastating fungal disease of apple that results in premature defoliation and diminished fruit quality or unmarketable fruit. Additionally the disease may cause decreased winter hardiness and reduced crop return. 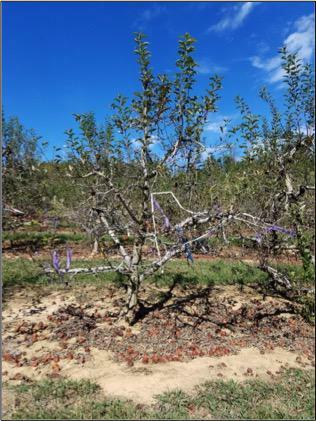 While Glomerella leaf spot and fruit rot must be managed annually in North Carolina, other apple growing regions in the eastern United States have reported occasional outbreaks during hot and humid growing seasons. Glomerella leaf spot and fruit rot is caused by fungi in the Colletotrichum gloeosporioides species complex. Symptoms of the leaf spot stage of the disease begin as tiny purple flecks or specks on the front of the leaf. In the absence of fungicide intervention, the purple flecks rapidly expand into irregularly shaped, often concentric, lesions. Later in the infection process, leaves become chlorotic (yellow) and drop prematurely prior to harvest. Most commonly, early symptoms of Glomerella leaf spot will appear within the lower inner tree canopy, however, initial disease symptoms have been observed on terminal leaves and high in the canopy. Glomerella fruit rot symptoms initially appear as small sunken lesions on either immature or mature fruit and are slightly larger than the size of a lenticel. The lesion may expand prior to or post-harvest and can evolve into a full rot. 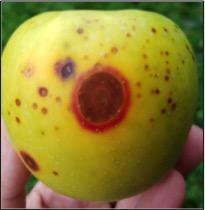 On yellow skinned cultivars at harvest, a red halo can be observed surrounding the rot lesion. Unlike more typical bitter rot symptoms, salmon colored sporulation is rarely to never observed with Glomerella fruit rot. Purple flecks and irregular lesions of Glomerella leaf spot. 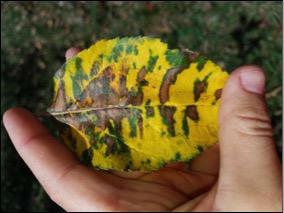 Leaf chlorosis during advanced Glomerella leaf spot. Red halo symptom of Glomerella fruit rot on mature 'Golden Delicious.'. 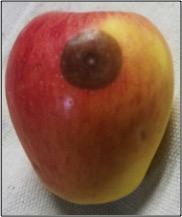 Sunken lesions on immature 'Gala' fruit. Glomerella fruit rot on mature 'Gala' fruit. Premature leaf drop resulting from Glomerella leaf spot. Hot and humid conditions favor infection by the Collectotrichum fungi causing Glomerella leaf spot and fruit and disease development. 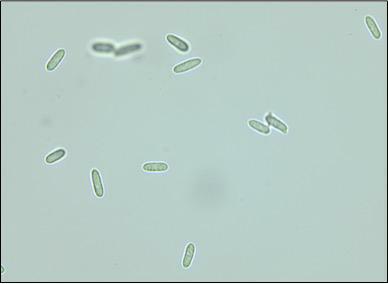 Infection by conidia occurs between 59°F and 95°F, with an optimal temperature of 82°F. A minimum 2.76 hours of leaf wetness are required for infection to occur. Research regarding the sources of inoculum for Glomerella leaf spot and fruit rot is currently being conducted. The main source of primary inoculum for the disease appears to be infected leaves overwintering on the orchard floor. Ascospores are released from perithecia sometime around the blom / petal fall growth stage. The development of perithecia on infected / fallen leaves has not been observed in North Carolina during the growing season. 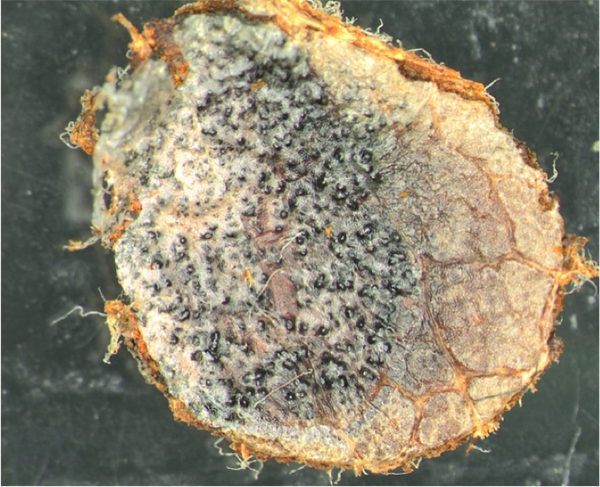 Other sources of Glomerella leaf spot and fruit rot inoculum that are currently being investigated include cankers, buds, mummified fruit, and other plant hosts. Perithecia developing on a leaf lesion, December 2016. Once the disease is observed in the orchard, Glomerella leaf spot and fruit rot can be difficult to control. Management, therefore should be focused on prevention and consist of a combination of cultural and chemical interventions. Plant less susceptible/resistant cultivars. 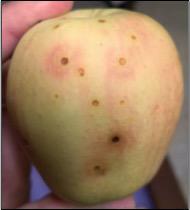 Cultivars with 'Golden Delicious' parents tend to be most susceptible to Glomerella leaf spot and fruit rot. In North Carolina, fungicide programs to manage Glomerella leaf spot and fruit rot should begin at petal fall and continue on 7 to 14 day intervals through harvest. It is suggested that single-site fungicides be applied in tank mixture with a multi-site protectant for resistance management. The table below lists active ingredients / products that have demonstrated high levels of efficacy in field trials at NC State. A more comprehensive list of registered fungicides for Glomerella leaf spot and fruit rot management may be found in the Integrated Orchard Management Guide for Commercial Apples in the Southeast. Please note that fungicide labels are legal documents-always read and follow label directions. Table 1. Example commerical fungicides for glomerella leaf spot and fruit rot.